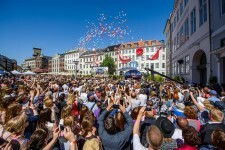 Church of Scientology grand opening rekindles the spirit and soul of Copenhagen's historical heart. Copenhagen, Denmark, May 27, 2017	(Newswire.com) - Stroll down the longest and busiest walking street in Europe and you arrive at the very birthplace of Copenhagen. A site where two historic squares converge—Nytorv (New Square) and Gammeltorv (Old Square)—the original meeting and marketplace for Danes when just a mercantile community nearly 1,200 years ago. Since then it has been the sight of great disasters, divine art and everyday Danish life. Today, it is where the past engages the present, as this is the gathering place for all Copenhageners. 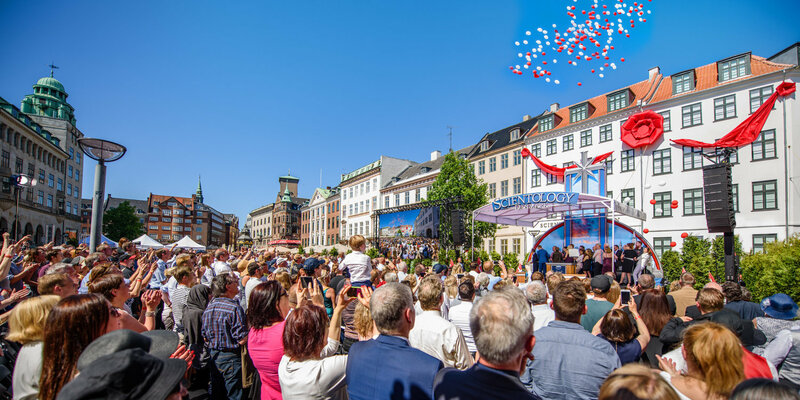 So it was, on a glorious Danish afternoon, more than 2,500 Scientologists and guests assembled on the cobblestone square to celebrate a new page in the history of one of Scandinavia's oldest and richest cultural capitals and the next step in the Church's season of expansion. 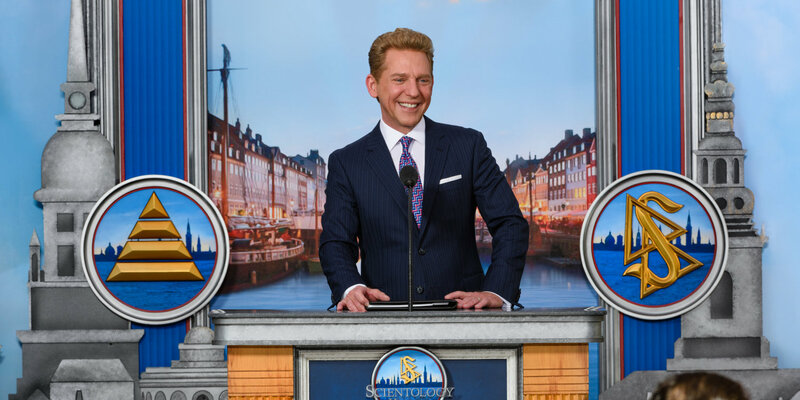 Mr. David Miscavige, ecclesiastical leader of the Scientology religion, presided over the dedication ceremony, recounting the journey to this epic accomplishment. "As some of you may recall, we once met upon a midnight hour. Whereupon, you presented a future vision of this Church. I shared your vision and you pledged to make it a fact. So, on this day when wind, sleet or snow couldn't keep me away, I came in glorious Spring to say: 'You made it, you did it, you saw it and seized it. And here now stands the world's most ideally placed Church of Scientology, in the name of spiritual freedom and the exercise of eternal free will for all Denmark.'" From the opening notes of Hans Christian Andersen's "In Denmark I was Born," the thousands present witnessed a grand opening ceremony of both national tradition and a sense of wonder. Dignitaries on hand enlivened the occasion with tales of humanitarian partnerships for a greater Denmark, of adventure where the treasure is knowledge to be shared with all and with a recognition of a historic landmark now magically transformed back to life. The Church redesigned, restored and renewed its new home in central Copenhagen. At 40,000 square feet, this Neoclassical building was originally constructed in 1796 and was born out of the flames of the "Great Fire" just one year prior that had consumed the Nytorv/Gammeltorv district. In fact, city planning mandated the building's distinctive "broken corner" façade to allow long-ladder fire engines access to the city's narrow streets. 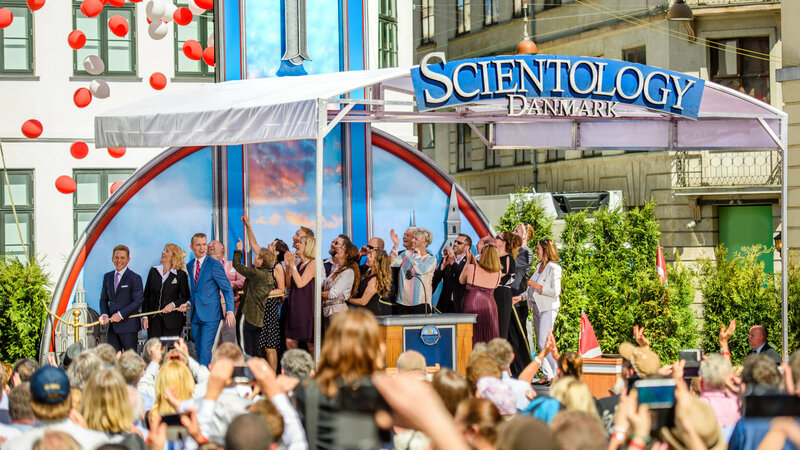 Denmark's new Church of Scientology stands five-stories tall and just steps from the Strøget, where 75,000 pedestrians pass by every day. As such, it serves as a central city hub for a number of humanitarian initiatives that have earned the respect of Copenhagen's civic community. For three decades, Church-sponsored drug education groups have reached out to the country's youth with hundreds of thousands of copies of The Truth About Drugs booklets; The Way to Happiness organization has held neighborhood cleanups and blanketed Copenhagen streets with the commonsense nonreligious code for moral living written by L. Ron Hubbard; all while the local chapter of Youth for Human Rights has worked to uphold their national heritage by creating an annual "Awareness March" and overall reaching more than two hundred thousand with their human rights message. City Councilor Mygind addressed those gathered to inaugurate the new Church and spoke of his commitment to human rights as the factor that underlies all social issues. "Human rights form the pillars of our society, but where they fracture, we find our greatest misery and despair. Our strength lies in unity and so, in the spirit of that unity, I began my partnership with Youth for Human Rights." Mr. Mygind further described how that incisive human rights partnership was born, "It was about eight years ago that a group of enthusiastic young people approached me and asked to collaborate on a walk for the International Day of Human Rights. The spark and life of those students was infectious—how could I say no? Hundreds of Danish youth participated, marching from the City Center to Nørrebro. There were even dance crews, singers and rappers performing. This was human rights in live action on the streets of Copenhagen. Now, year after year, we walk together and we march together. And, altogether we have inspired a youth movement that's crisscrossed our city. So, it is no longer just your walk, it's our walk." Chief Superintendent for the Danish Police (Ret. ), Mr. Thøger Berg Nielsen, knew all too well the tragedy of drug abuse. "I have seen the bodies of many acquaintances and addicts who started on drugs and then died," he said. "As a police official, I was the last one to say goodbye to them. Our society has tried all kinds of solutions, but to no avail. So drug criminality formed a black chapter in my service. I hit a wall, and there was nothing I could do. But just when things couldn't get darker, I was introduced to something completely new—Narconon." It was 10 years ago that he discovered the drug rehabilitation program, developed by Scientology Founder L. Ron Hubbard, at a Danish facility northwest of Copenhagen, "I remember meeting a father who was visiting his son. He said, 'My boy has been saved, and I will introduce you to him.' His son had been addicted to heroin for 10 years, and I looked into his eyes and heart and saw life. Until I witnessed it myself, I didn't believe hard-core addicts could be rehabilitated. But the graduates were real, and their stories were a miraculous reality." Historic restoration architect, Mr. Bjarke Christensen, has helped preserve the timeless face of Copenhagen for more than 35 years, and he spoke to the significance of transforming the Church's landmark. "Your Neoclassical home looks over this historic square and offers up its own story. By way of example, the favorite sons who resided here include authors of the Danish Constitution and our national anthem—not to mention poets and statesmen of every stature. So, both this square and this house carry the spirit of our city. And thus, with the opening of this Ideal Org, Copenhagen's birthplace finds new life." "When we shape our buildings, thereafter, our buildings shape us," continued Mr. Christensen. "Throughout the course of a decade, you not only entertained the idea of restoration, you embraced it. And together, we have designed a striking, modern building behind the traditional face of classical Denmark. So yes, this building from the Danish Golden Age has now entered the Scientology Golden Age." Publishing executive and advisor to the Copenhagen Commune, Mr. Rene Jensen, spoke of his early adventure and subsequent discovery of L. Ron Hubbard's teachings, "As a young man, I took a year and traveled around the world in search of knowledge. That trip brought me to Finland, across Russia, to the Far East and Australia. It was there I saw the tapestry of humanity. And I returned home with an aching desire for new chances to grow. So when I came across your Founder's writing, I thought, 'Here begins a new journey.' Because it was no longer enough to exist, it was time to discover L. Ron Hubbard and live." Mr. Jensen, concluded with a tribute to Mr. Hubbard and the spirit of the day as one of tremendous anticipation for a wonderful future. "L. Ron Hubbard stands apart from so many others before him. He was both a knowledge seeker and a knowledge sharer. He would find a stone of wisdom and turn it and turn it again, always seeking to know more. So today, we celebrate a house of wisdom built from those stones. May it be the foundation for the people of Denmark to grow, to explore, to live and to soar." The Information Center also details the many humanitarian programs that Scientology supports. 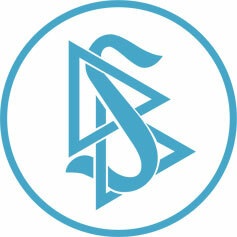 They include a worldwide human rights education initiative; a far-reaching drug education, prevention and rehabilitation program; a global network of literacy and learning centers; and the Scientology Volunteer Minister program, which has become the world's largest independent relief force.